Not having learned art before– besides craft projects for kids, I found contour drawing the hardest. four weekly drawings in sketchbook the hardest assignment. I understood the importance of it. I googled images for sketch examples. Still, I did not have clear concept of sketch drawing: how long should I spend time on one sketch? Should I only draw what I see? 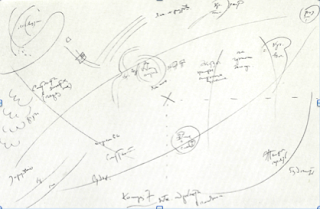 One of Wally Kandinsky’s drawing blew away my concern. “Drawing No.6” is just so Kandinsky. His drawings were different from classic ones. Instead of exploring the observed world, he depicted abstraction and nonrepresentational imagery – he drew what he liked. Not all of his artworks are abstract like the one above. In fact, he became an artist late and established his style through ample measure of transitional development. He was born in Russia on December 16th 1866. And he decided to become an artist and went to Academy of Fine Arts, Munich in his thirties. Until then, he studied privately. He was interested in colors and psychology. He used bright colors and dark background during his amateur period. At Academy of Fine Arts, Munich, he started off as landscape painter. At first, he diligently explored Munich and countryside. 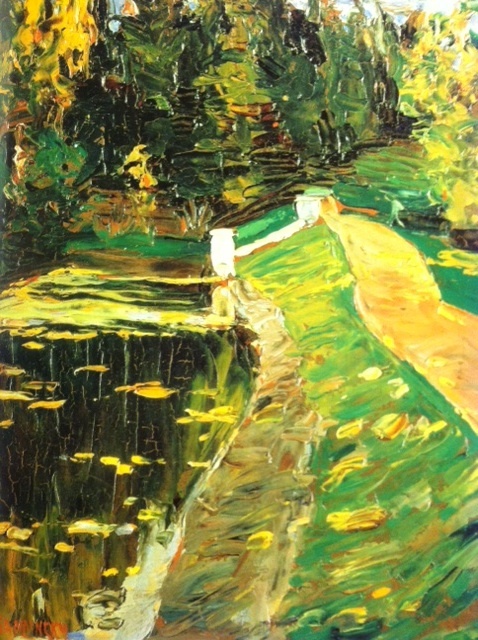 He used palette-knife strokes and its clear structures in his early works. 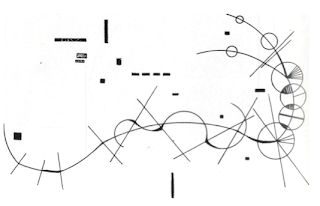 (His first drawings are so different from his geometric, abstract ones that I thought I found the wrong picture.) In Kandinsky’s manner of working, observation and painting were distinct – he drew in his studio heavily depending on his memory. His reliance on visual experiences could have caused ater works become dreamy. Smooth and chuncky strokes replaced rough and choppy ones found in early works. 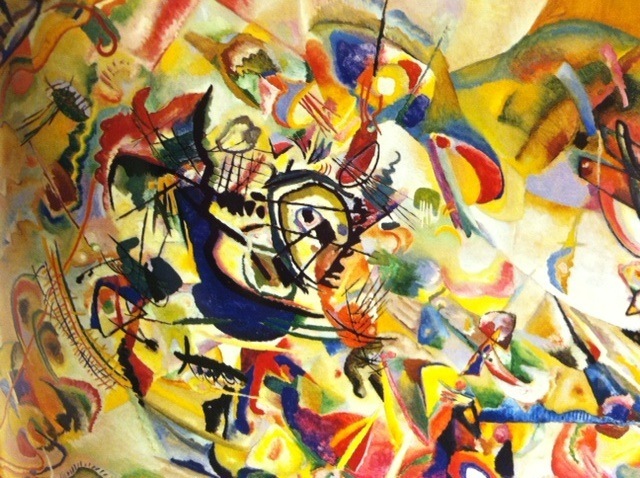 Although the work is shockly abstract, Kandinsky diligently created his style based on his visual experiences. I was amazed how he first sketched his work in pencil with notes, sketched in colors, and finally drew the final work. 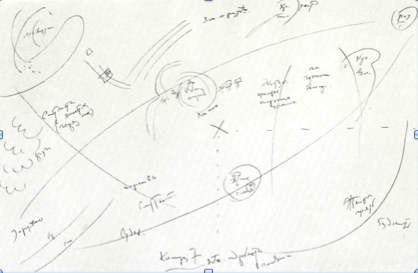 And here, he used sketches for study-drawing. 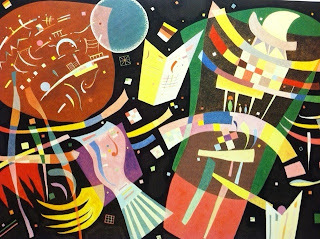 In 1922, Kadinsky became a professor at the Bauhaus. During this period, he used more precise geometrical shapes: lines, radiating segments, circles … Also he used more calm and cooler colors. When the Bauhaus closed in 1932, he moved to Paris. He drew similar geometric, abstract paintings yet more colorful. In December 13, 1944 he died in France. Kandinsky, one of my favorite artists, gave me a lot of hope. He proved that there is no late start in art – I just need to extra effort to catch up. Also, he gave me crystal clear idea for drawings and sketches. I thought sketchbook is for “imitation” practice – so that I learn to depict object more accurately. However, I realized sketchbook is like personal blog. I can doodle or draw whatever I want; study-draw or design. James Abbott McNeillWhistler, American-born in 1834, became a major artist in the movements towards realism and pre-Raphaelism. At West Point he excelled in drawing but soon became a dropout in 1854 at the age of twenty--by explusion, not choice--for "deficiency in chemistry" ("WebMuseum 1). (This really hits home for a lot of us artists.) It was then that he moved to Europe, where he would remain for the remainder of his life, juggling homes in Paris and London searching for artistic acclaim. He became famous for oddly contrasting styles in drawing and painting--rough, sketchy drawings and soft, realistic paintings. His versatility was further embodied in his love of Oriental art, which he often tried to imitate. Personally, I chose to research Whistler because of his classic messiness/boldness in drawings and realism in paintings. My styles match this exactly. Also, his use of hatching astounds me, which can be seen in the examples of his work attached here. He so freely and loosely creates figures that all at once look so real. I love the idea of turning the semi-abstract into utter reality--I believe it is the artist's duty to do so, actually. Also, Whistler's personality immediately drew me into him as an artist and person in general. He was known for his quick quips, witty personality, and sheer confidence. Because of this, he often did not seem to others as the quintessential painter. This can be seen when a colleague of his asked, " 'But my dear Whistler…you leave your work so rough and sketchy. Why do you never finish?' Whistler…gave a fiendish laugh. 'My dear Leighton,' said he 'why do you ever begin?' " (Chubb 86). Chubb, Edwin Watts. Sketches of Great Painters. Freeport, NY: for Libraries, 1968. Print. Lochnan, Katharine Jordan., and James McNeill Whistler. The Etchings of James McNeill Whistler. New Haven: Published in Association with the Art Gallery of Ontario by Yale UP, 1984. Print. "WebMuseum: Whistler, James Abbott McNeill." Ibiblio - The Public's Library and Digital Archive. WebMuseum, Paris, 4 Oct. 2002. Web. 29 Sept. 2011. .